Come on out to our Senior High youth group's Rummage Sale Fundraiser on Saturday, TBDrom 8:00 AM to 2:00 PM! All profits go toward our Sr. High's summer mission trips. Notable items: TV, furniture, exercise equipment, household goods, clothing, etc. It's that time of the year again! Come out and support our Senior High students as they raise funds for their Summer of 2016 mission trip! 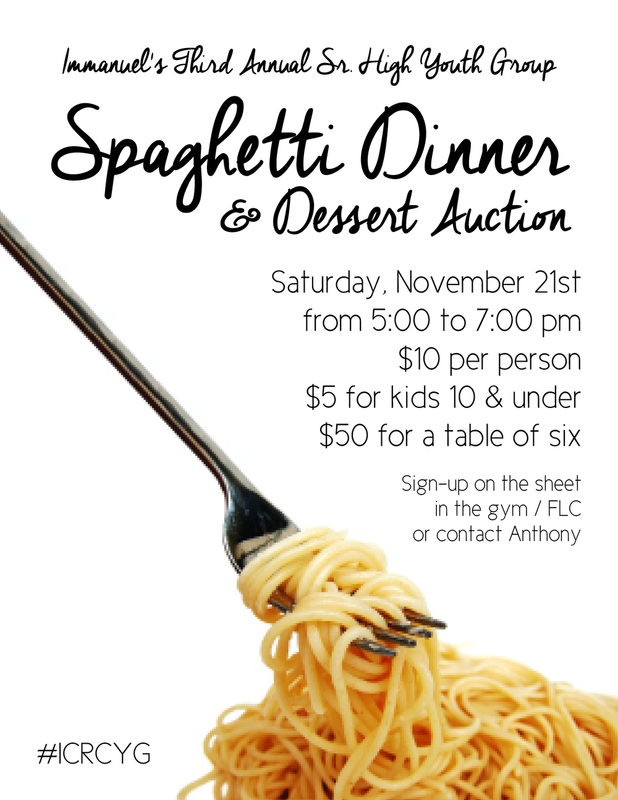 There will be delicious spaghetti and dozens of yummy baked goods from some of our best ICRC bakers up for auction! Don't miss out on all of the fun! *Sign-Up sheets for attending the event and for volunteering to donate a baked good or two are located in the gym / Family Life Center (FLC).